Dr. Sullivan received her medical degree from Stony Brook School of Medicine. She completed her internal medicine residency training at Bronx Municipal Hospital Center. She is board certified in internal medicine by the American Board of Internal Medicine. 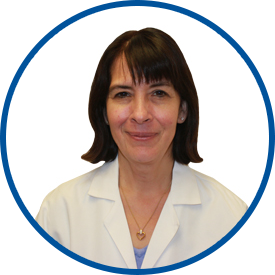 She has been in private practice in Yonkers since 1988. She joined Westmed Medical Group in July 2012. Dr. Sullivan is affiliated with St. John’s Riverside Hospital. Dr Sullivan is an extremely knowledgeable physician who takes the time to explain and answer questions or concerns in a very understandable way. She is a wonderful person & doctor. I couldn't ask for a better physician. She is an asset to your practice. knows me like a book when it comes to my medical needs. Dr Sullivan is wonderful & I am so glad she is my doctor. Again, Dr. Sullivan is the best. My confidence in Dr. Sullivan is through the roof. I actually feel honored to have her as my doctor. Because I feel the way I do about Dr. Sullivan, my wife and daughter now have appointments with her. I said it all and will say again, I made the right choice in having Dr Sullivan as my primary doctor. She takes exceptionally good care of me and my health matters. I have recommended friends who have become her patients. Comprehensive annual - check-up *Dr. Sullivan very caring and very diligent. Dr. Sullivan is caring, knowledgeable and thorough. wish every doctor showed the same level of care.